From an artist to a scientist, my daughter knows she can be anything she wants to be. Currently, she is extremely interested in the sciences, especially space and the weather. The “Barbie Careers Pilot Doll” takes her love of science and combines it with an amazing career. She can explore weather patterns and aerodynamics as she imagines amazing and epic adventures with Barbie. 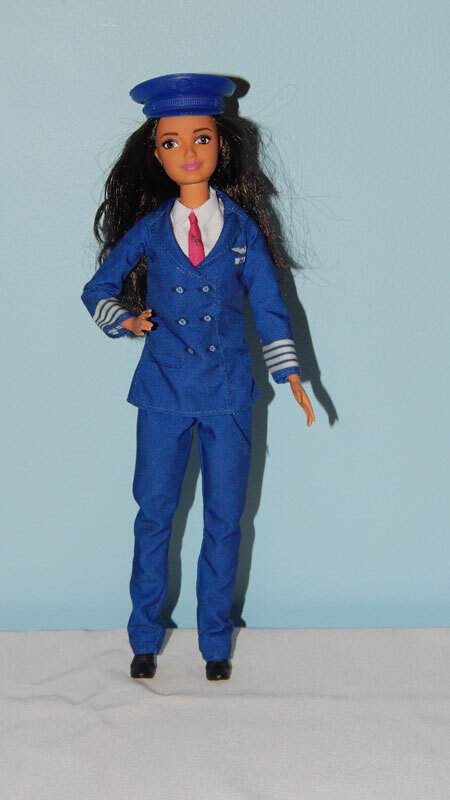 The Barbie Pilot Dolls is wearing a blue pilot’s uniform with a red tie and wing insignia details. She has black boots and a pilot’s cap. The cap falls off with every little movement. Her brown hair is can be brushed and styled. I love that this Barbie has a realistic body shape. I was disappointed to find that Barbie’s knees and elbows do not bend. This makes it difficult to fit her into my daughter’s dollhouse and cars. Her arm is permanently bent at the elbow which makes it hard to get her dressed. Barbie does move at the neck, shoulder and hips. The “Barbie Pilot Doll” is significantly smaller than the “Barbie Walk and Potty Pup”. She is closer to the size of Skipper from the Babysitters Inc Playset. Your little one can explore different careers with this line of Barbie dolls. My daughter was excited to learn that there were so many careers to choose from and is looking to get the vet doll next. I love that this line of dolls encourages my daughter to explore a variety of careers, some that she never believed possible! *Disclosure: I received a complimentary “Barbie Pilot Doll” through the Amazon Vine Program in exchange for my review. All opinions are 100% my own.